When it comes to conversion, email is the king of all marketing tactics. That is because email has the highest ROI over any other digital channel in B2B marketing. However, those returns will only happen if your campaigns can convert your email audience into customers. Altering specific elements of your email campaign may potentially be the key to improving your conversion rates. Sometimes, something as simple as tweaking the subject line may make the difference between high and low open rates. This article covers the five essential steps your marketing team should implement to increase the conversion rates of your email campaigns. 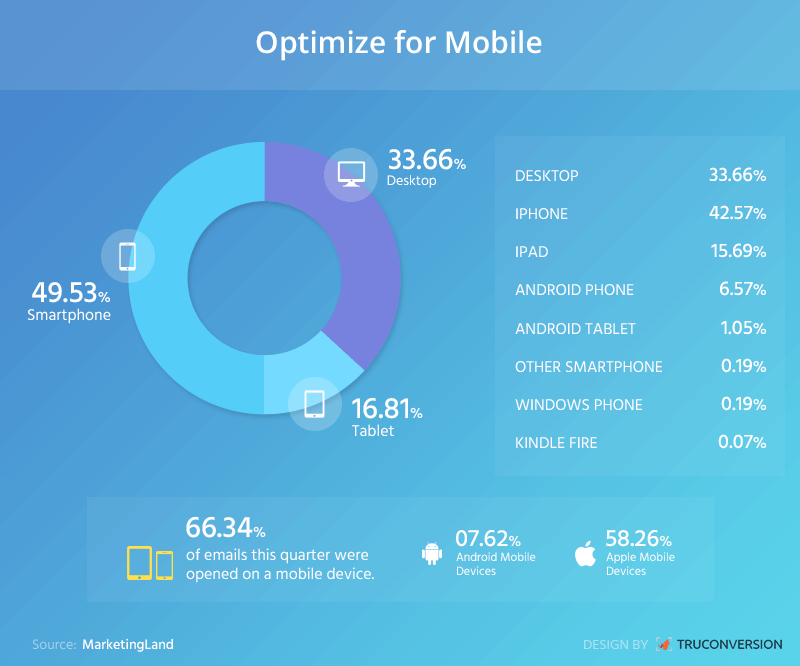 Nowadays, more emails are read on mobile devices than on any other type of device and this trend is not expected to drop off any time soon. This fact, by itself, should be enough motivation for you to consider optimizing your email campaigns. Create a short subject line so it can be properly displayed on smartphones (30-35 characters). Break up text, provide white space so readers can easily skim. Use a single column layout, and make use of shorter and concise copy. Use larger fonts to improve readability. Make your links visible and easily clickable. Make your CTA buttons bulletproof so they run better on mobile devices. Reduce the size of your images to shorten load time. The type (quality) of your subscribers. Active monitoring and updating of your list: adding new subscribers and removing inactive ones. The focus and effort placed on attracting only high potential subscribers. How well you've segmented your list. By using segmentation to send out more personalized and tailored email campaigns, you will increase the relevance for your recipients. Relevance is among the main factors that will help you retain subscribers over the long-term and keep them engaged. To improve relevance, you need to understand the distinct groups of people that comprise your email list. Segmentation is about understanding your subscribers and speaking to them in a way that shows you are taking their unique needs and wants into consideration. Once you segment your list, you need to find the best way to approach your subscribers. Your subject line, the sender name, and the quality of the content are the three things that will determine your recipients' reactions to your campaign. The sender name is usually the first thing that recipients notice when they receive an email. For that reason, the name under which you send your emails should be clear and recognizable. Ideally it should also be personal, rather than a generic company email address. Of course, your sender name can be branded. In this case, you should make sure that the name you use is consistent, and that recipients always get emails from the same sender. For example, the sender of the post-enrollment confirmation email should also send any follow-up emails. Write short and descriptive subject lines (also because of mobile subject line character limitations). Introduce an element of curiosity, urgency, relevance, value, or emotion (CURVE principle) - each of these can have different effects on your open and conversion rates. Personalize your subject lines and/or include local information. Use the preview text as an extension of your subject line to add further relevance and pique interest. Once you've enticed recipients to open your email through an inviting subject line and preview text, you need to offer compelling content to them. The type of content you write depends on the goal of your email campaign. To build a more solid relationship with your subscribers, you should ideally optimize your content for open and share rates, rather than just clickthrough. Of course, your content also needs to be tailored to the lists you are sending it to, and it should be addressing the needs of the recipients in each specific list, and the stage in the buying cycle they identify with. As simple as it may sound, double opt-in is actually a terrific way to create further engagement and commitment. Double opt-in is simply the practice of asking people to confirm that they've signed up for a newsletter by clicking on a confirmation link they receive via email. Fills your list with people who have made a conscious decision to subscribe to your list (higher quality subscribers). Increases the likelihood that recipients will engage with your emails. Provides you with the opportunity to speak to them immediately by introducing yourself in the opt-in email. Provides a marketing opportunity and can include special offers to start moving subscribers down the funnel. And then there's the element of establishing contact immediately after someone has signed up. Given that subscribers are more alert to what you are offering right after their initial interaction with your brand, this step is critical to success. Opting in is just one example of a behavioral trigger. There are many strategies and tools that you can use to automate your campaigns to respond to particular subscriber actions. Behavior triggered emails are sent in response to an action taken by a subscriber. They consistently drive better conversion rates because of the immediacy they create when users get a response based on something they did. Welcome email when a prospect becomes a customer. Clicks, visits, or form submissions. Bottom-of-the-funnel conversion events (events that signal a serious interest in your products or services). Inactive/Dormant subscribers after a certain period. Registration or signaling attendance at an event you will be hosting, such as a webinar or a Q&A session. Page abandonment such as homepage, category page, product page, site search, or shopping cart abandonment. Past purchases trigger - sending an upsell email. Upcoming purchase reminder - for cyclical purchases. There are many other instances and opportunities where using automated campaigns to reach out to subscribers may be beneficial. However, do not forget relevancy! You need to ensure that your automated campaigns still are relevant and provide value to the recipients to increase the chances of conversion. Testing and implementing the aforementioned steps will help you improve your email campaign performance. Conversion rates are often influenced positively by seemingly minor details. For example, changing the subject line may seem like a minor alteration, but considering that it only takes seconds for the recipients to decide whether you deserve their attention or not, your subject line can have quite an impact. Test and experiment with various combinations of the steps listed above, and you’ll be sure to see momentous results.